Barrio Sur is a working-class neighborhood with residents mainly of African-Uruguayan descent. At present, housing projects for middle-class families are being built as part of the area’s gentrification. The roots of candombé—an Uruguayan musical drum rhythm brought to the country by African slaves—are strong in Barrio Sur. Drum circles perform candombé for locals and visitors every Sunday night, particularly along the street called Isla de Flores. The Las Llamadas, a rousing festival where drummers fill the streets and play candombé, is also held here every first Friday of February. 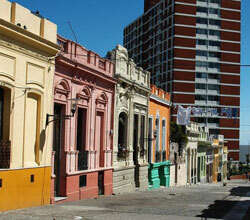 Isla de Flores is a section of Calle Carlos Gardel, which was named after a famous tango singer.